Purveyors of thrash since 2012 and hailing from Boston, MA – Black Mass have been a mainstay in a thriving New England metal scene. Releasing three demos, an EP and full-length in the six years, they’ve also gained the opportunity to tour both coasts of America and three Canadian tours between 2015-2018 – proving their mettle on the road, winning over people in the DIY club circuit. Signing with Iron Shield Records, Warlust is the trio’s second full-length – aiming to keep the style true as the band willingly grab from a host of 80’s thrash, death, and even blackened /rock n’ roll influences to create a forceful energetic sound. The sounds of gunfire, explosions, and an air raid siren open the record, before the churning axe/bass antics and steady pummeling drums and roaring, maniacal vocals for the title track charge with reckless abandon, giving off the vibe that Venom and Razor are entering a death march before the mid-tempo transition allows the listener to engage in important headbanging maneuvers. The drumming of Alex Fewell has that punk meets rock spirit that taken into a thrash context keeps the adrenaline overflowing during “Programmable Life Forms” as well as the scattershot insanity within “Hellhounds” (the latter injecting some blast beats for proper measures). Guitarist Brendan O’hare and bassist Cristian Azevedo set up their tones and riff interplay as a thick wall of fierce electricity – which can be groovy in spots for “Bible Stomp”, but never loses that raw, underground appeal that elevated the genre during its initial uptick from say 1985-1987. Early Slayer factors into the rhythmic vocal nature Brendan exudes, matching up perfectly for the tremolo-fueled action during “High Priest in Black”, the marching nature of the instrumental transition relatively soothing before the next upper gear tempo shift kicks in. 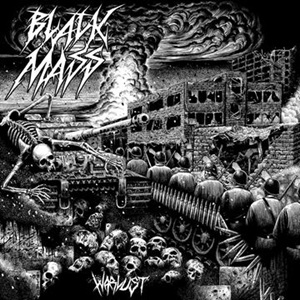 Death, sacrifices, lust, greed – beyond war these are the lyrical topics Black Mass treasures – as well as a Motörhead-ish ending for “Fueled by Drugs”, complete with a dialogue between band members at the end. Warlust brings this scribe back to the days when thrash wasn’t glossy, overproduced, looking for commercial acceptance or pandering to major label executives and their wishes. Ten tracks in an ideal short and sweet timeframe, Black Mass execute in that primal manner that a three-piece should stand upon, leaving studio tricks to other bands who can’t plug in and play.